Blue is one of those colours that I wear a lot of clothes-wise but I rarely seem to wear it on my nails for some reason. To remedy this, I've slapped on this beauty from B. This shade named Brit is a classic medium blue, but it 'pops' a lot more than I was expecting it to and makes a good change from the usual neutrals and darker shades that I tend to wear to death! Formula was a tiny bit thick, but this allowed me to do two coats quite quickly and so far, it's lasted 3 days with minimal tip wear. Not bad! 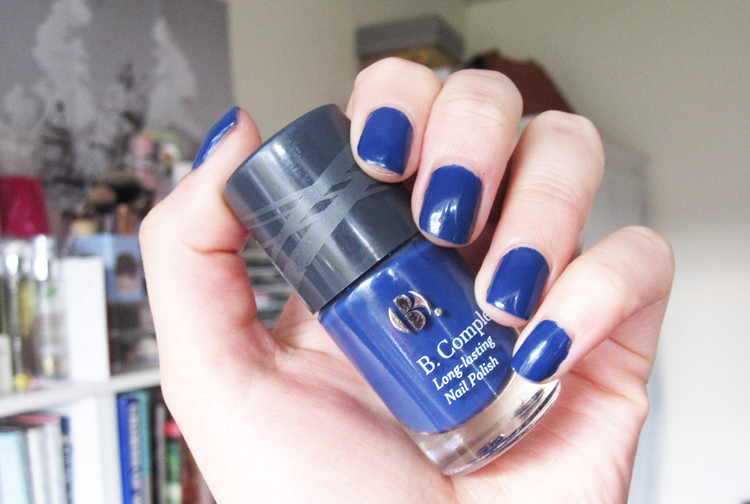 If you're unfamiliar with B., they are a fab budget friendly brand who are exclusive to Superdrug. The whole range is also cruelty free certified, parabens free and many products are suitable for vegans too. B.Complete Long Lasting Nail Polish in Brit* retails for £4.99 (8ml) and is available in Superdrug, both instores and online at superdrug.com - currently in the 3 for 2 deal! I'm wearing baby blue Deborah gel nail polish, love it.